Stamford Bridge star wins the top gong. 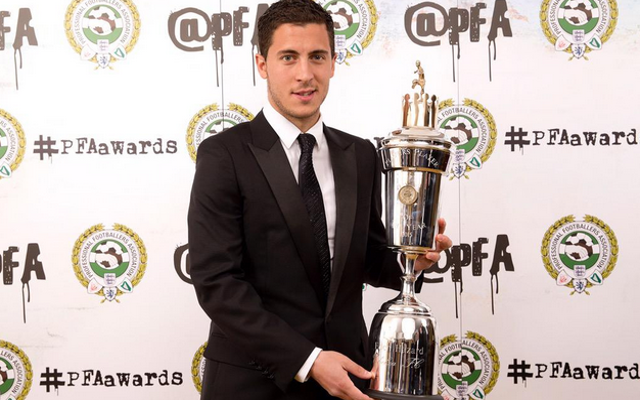 Eden Hazard has been named as the PFA Player of the Year for 2014/15 after a hugely impressive campaign from the Belgian. The 24 year old is into his third season at Stamford Bridge and has proven very effective in the final third, notching up 13 Premier League goals as well as eight assists, and put in consistent displays that have been pivotal in Chelsea’s run to a likely title triumph. Hazard picked up the PFA Young Player of the Year award last term and has matured into an even more accomplished performer over the past year and is one of six Chelsea stars who made it into the PFA team of the year, the other Blues stars coming in the form of John Terry, Gary Cahill, Branislav Ivanovic, Nemanja Matic and Diego Costa.